Wolseley UK is part of the global plumbing and heating products company Wolseley PLC and is also a supplier of construction materials. It has launched a commitment to green energy solutions of which the new solar array is part. 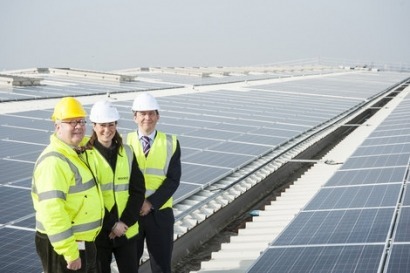 The roof of the company’s UK National Distribution Centre, which at 13,113m² is around the size of two football pitches, has now been covered in 8020 PV panels, along with 24 inverters, at Wolseley UK’s head office site. The installation took 6 months to complete and is set to generate 2MW of electricity per year. This means that at full capacity the system will completely power the distribution centre while also creating a 10 percent power surplus and displacing 1280 tonnes of carbon per year. The array will additionally earn the company a projected £6.5 million income over 20 years through the government’s Feed In Tariff (FIT) for commercial buildings with a payback period of 6.8 years. The system will help to showcase some of the renewable energy products that Wolseley UK supplies to its customers via its Plumb and Parts Centre. The installation also boasts two unique innovations to maximise energy efficiency and site safety. Exhaust air from the inverters is channelled into the building’s heating systems, potentially generating around 80kW of additional heat. A safety feature has also been built in which means panels will disconnect if the fire alarm is activated, due to the automated DC breakers situated within the string fuse boxes, which are connected to the building’s fire control system.